Choosing the right eye LASIK surgery center is the first, and most important decision you will make during your LASIK journey. No matter what, it is important to make sure you feel comfortable with not only your surgeon, but also the LASIK center overall. Knowing that you are in good hands and that you made the right decision will give you peace of mind throughout your entire LASIK procedure. As a leading provider of LASIK surgery in Peoria, IL, the LASIK Institute at Illinois Eye Center strives to provide our patients with quality service that will benefit their overall eye health, and give them the results they deserve. 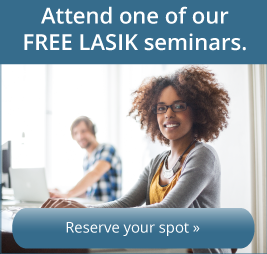 For more information on LASIK, you can download information from our website, request a consultation or sign up for one of our LASIK seminars. WaveLight® Refractive Suite is the safest, most advanced form of LASIK treatment available today. The Wavelight® FS200 Laser is a 100% blade-free technique used to perform the critical first step in the LASIK procedure: creating the corneal flap. Specially designed for fast, precise custom flap creation, the Wavelight® FS200 Laser prepares the eye for the second step of the LASIK procedure where an excimer laser is used on the inner cornea to correct vision. The WaveLight® EX500 excimer laser is a major advancement in refractive surgery - providing the right combination of speed, precision and personalization to correct unique imperfections in your vision. The Wavelight® EX500 excimer laser incorporates numerous technological advancements including multi-dimensional eyetracking, online pachymetry, fast small flying-spot ablations and three customizable wavefront correction platforms for the most precise outcomes available for vision correction surgery. Check out www.reclaimyourvision.com for more details. Am I a Candidate For the LASIK Procedure? Most patients who come to us for refractive surgery are excellent candidates for LASIK. Because everyone's eyes are different, however, your surgeon may decide that LASIK is not the best vision correction option for you. Our commitment to superior technology means that our patients have an excellent chance of achieving optimum results. Your surgeon will review a number of factors including your eye history, current prescription and current health to determine the procedure that suits you best. Take our short questionnaire to see if you may be a good candidate for LASIK. The vast majority of people who have LASIK performed obtain excellent results that live up to or exceed their expectations. Advances in LASIK technology and surgical techniques have improved outcomes and decreased risks and complications associated with the procedure. However, like any other modern surgical procedure, laser eye surgery is not entirely risk free. LASIK complications are very rare. But even with the best surgeons, best-screened patients, and best equipment, the small risk of certain complications remains. Studies have consistently shown that LASIK complications decline as surgeon experience increases, so you can help your chances of a good outcome by selecting a surgeon who has performed a large number (greater than 1000) of these procedures. If you are 40 and considering LASIK, presbyopia is an important concept to understand. Presbyopia is a normal and expected consequence of the aging process. The crystalline lens within your eyes is composed of proteins. These proteins are soft and flexible when you are younger. Typically beginning in your early 40's, presbyopia occurs as the protein composition of the crystalline lens changes, making it harder and less flexible. When the crystalline lens loses its ability to flex, it is no longer able to change its shape and effectively bend light rays as sharply. This diminishes the eye's ability to focus on near objects. When presbyopia begins, people who already wear glasses may need bifocals or trifocals, and those who have never worn glasses may require reading glasses. Today, there are strategies to help deal with the inconveniences of presbyopia. If you need to have your distance vision corrected because you are nearsighted, farsighted or have astigmatism and need some help with close vision because your are beginning to experience presbyopia, LASIK may be an option if performed as a specialized "monovision" LASIK. Monovision is a consideration for people experiencing presbyopia and interested in LASIK. Typically with monovision, the dominant eye (usually in line with your dominant hand) is corrected for clear distance vision. The non-dominant eye is then purposefully corrected in a way that yields better vision up close. Patients over forty must make a choice. Either both eyes are corrected for distance, or one eye is corrected for distance and the other for near. If a patient is unsure of what they would like, contact lenses can often be used to simulate post-operative results. If you are over 40, or wear bifocals or reading glasses, your LASIK surgeon will want to discuss monovision during your consultation in order to make sure you end up with a satisfying and functional result. The choice to undergo LASIK is exciting. Better vision has literally changed the lives of millions of people. But deciding to have LASIK is a big decision that requires careful consideration and planning. Our highly experienced surgeons and our professional vision team are ready to address your concerns and answer all of your questions so you can achieve an excellent visual outcome. Difficulty Focusing on Close Objects – Is It Presbyopia? Dr. Kolletis, "LASIK Myths Exposed"
Dr. Kolettis, "Am I a Good Candidate for LASIK?"